Serves 2. Servces 6 as a small appetizer. Pre-heat a stovetop grill pan or outdoor BBQ grill. Serve on small appetizer spoons, or with tortilla chips to scoop, or lettuce cups to wrap around the tuna. Yellowfin Ahi Tuna Poke Cubes make an incredible first course at a holiday dinner party and can be served also as shots at a cocktail party. It is likely to be the quickest recipe you make and have the biggest impact on your party guests. Ahi Poke Recipe has only seven ingredients and can be made the morning of the party and set out right before it starts. If you like sushi or ceviche, you will LOVE poke! Ahi Poke cubes can be seasoned and used in an infinite variety of preparations such as tuna towers, tuna tartare, tuna nachos, cocktails, ceviche, seafood salads, party platters. 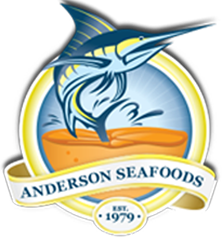 When buying Ahi Poke cubes online, make Anderson Seafoods your first and last source. Preparation: Defrost and Serve. Each bag contains 1 Lb of Yellowfin Ahi Poke. Place the Ahi Tuna Poke Cubes in a bowl. Gently toss. Serve immediately or cover and refrigerate. *For another variation, omit the chili sauce and add 1/2 tsp. wasabi paste and 1 tsp. honey.